Chemical Constituents and Components : Main chemical constituents are glycrrhizin, a mixture of potassium and calcium salts of glycyrrhizinic acid, glabranin A&B, glycyrrhetol, glabrolide, isoflavones, coumarins, triterpene sterols. Glycyrrhizinic Acid: 1. It exerts hypocholesterolemic action by stimulating the conversion of cholesterol into bile acids 2. It exhibits antimutagenic activity against ribose-lysine. 3. It possesses potent free radical scavenging activity. 4. It promotes decrease in lipid peroxidation in hepatic tissue homogenate and blood serum. 5. It stimulates the excretion of hormones by the adrenal cortex and prolongs the action of cortisone. Curing Diseases : 1. It is useful in cough, bronchitis, ulcer, fever, hiccough and hoarseness of voice. 2. 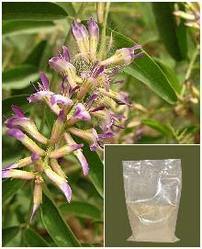 It is used in skin diseases, eye diseases, pharyngitis, epilepsy and anaemia. 3. It is useful in haemorrhoids, haemorrhage and urticaria. 4. Decoction of root is a good wash for falling and greying of hair. 5. It is also applied on cuts and wounds.